Clemson's Elijah Thomas snares a rebound against Boston College. Photo by Jason Schott. 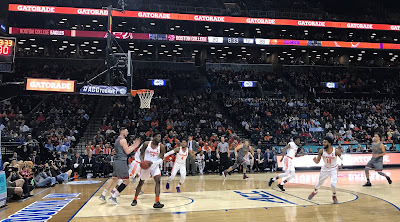 In the afternoon session of the third day of the ACC Tournament at Barclays Center on Thursday, Virginia beat Louisville 75-58, while Clemson beat Boston College, 90-82. Virginia, the top seed in the tournament, and fourth-seeded Clemson will meet on Friday night at 7 pm in the semifinals. Virginia, the top-ranked team in the country, took this game over late in the first half, when they went on a 19-4 run capped by a Kyle Guy three-pointer at the 3:17 mark to give them a 36-19 edge. They took a 38-27 lead into halftime. In the second half, Louisville got back into it and were trailing by 10, at 64-54 with 5:26 left on a pair of Deng Adel free throws. Virginia closed out the game on an 11-4 run, with Guy finishing it off with a dunk with 23 seconds left. Virginia held Louisville to one basket, a Ray Spalding layup with 31 seconds left, in the final nine minutes, and their Head Coach Tony Bennett said of that, "I think a couple times they helped us out. There just were a couple hot bounces and they missed a few easy ones. But they made a nice run to cut it to four or six, and we answered, and we got enough stops and guys made some good plays. Because they played them three times, we know how they can pull up and hit shots and touch the paint. So I just think we tightened up a little more, and a majority of the game they did have to earn their baskets." Virginia was led by Kye Guy, who had 19 points on 7-14 from the field, including 4-6 on three-pointers, with seven rebounds, an assist, and a steal. Devon Hall had 14 points on 6-10 shooting, and 2-4 on threes, with five assists and three rebounds. Bennett said of changing how the team prepares during March Madness, "Yeah, I think tournament basketball, it's about the possessions matter. We talk about this, and we just have been talking about the last -- I don't know how long, not to overcomplicate it, just to try to prepare well, and preparing well is how we rest, how we watch film and get ready for whoever we play next, try to improve from the things we saw, and then when the ball is tipped, really be ready to go and play at our highest. "We're a possession-by-possession team. That doesn't change. I don't know if that sets itself up for this. But records are out now, and it's just teams can play at a high level. You saw Pitt play Notre Dame close. You saw the swings in the Virginia Tech-Notre Dame game, so you just try to lock in. Louisville made one against us. I think our guys understand how we have to be." Boston College was the story of this tournament the first couple days, as the 12-seed beat Georgia Tech and upset #5 North Carolina State to make it to this game. Clemson dominated early, and led 43-36 at halftime, and by as many as 16, 55-39, with 13:45 left in the second half. 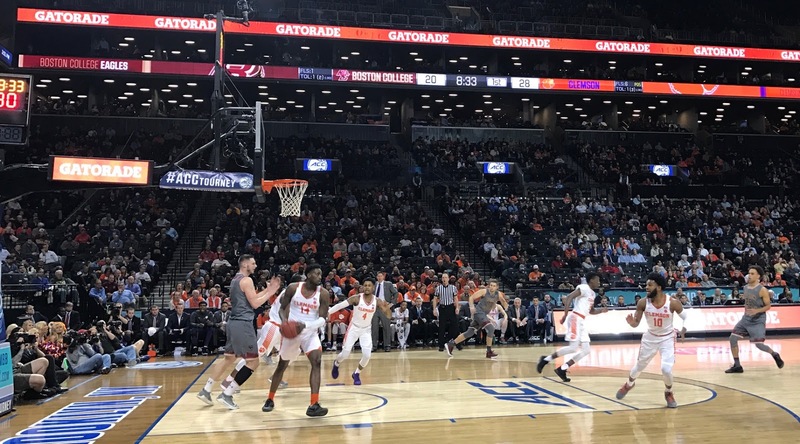 Boston College was not going to go down that easily, and they responded with a 22-8 run capped by a Ky Bowman three-pointer at the 5:49 mark that made it 63-61 Clemson. Over the next few minutes, Clemson went on an 11-3 run capped by a Shelton Mitchell layup to go back up 10 points, 74-64, with just 2:31 left. A minute later, Mitchell drained three straight free throws to make it a 12-point game, 81-69 and all but seal the win. Clemson was led by Gabe Devon, who had 25 points (8-18 FG, 3-11 on three-pointers), with four assists and three rebounds. This matched a career high in points (25) for Devon,and his 3 three-pointers raised his season total to 74 and he is in sole possession f 10th on Clemson's all-time list. This marks the seventh time this season that DeVoe has led the Tigers in scoring and his fifth scoring at least 20 points. Shelton Mitchell had 21 points on 6-12 from the field, 2-5 on threes, four rebounds, and an assist. Marcquise Reed had 12 points (4-10 FG, 2-5 threes), four assists and two rebounds. Aamir Simms had 10 points (3-7 FG, 2-3 threes) and nine rebounds, just missing a double-double, along with a pair of blocks and an assist. Boston College was led by Ky Bowman, who had 23 points on 6-16 from the field, including 4-8 on three-pointers, with eight rebounds and four assists. Jerome Robinson had 20 points (4-16 FG, 4-11 threes), three assists, two rebounds, and four costly turnovers. Clemson Head Coach Brad Brownell said of the game, Okay, just a really good win by our guys. I thought we -- obviously we shot it well. These guys played great. I thought we showed pretty good poise. We actually didn't get off to a great start in the game, but I liked the way we were playing. Even though we missed some shots early, we got down maybe it was 7-0. I told our guys I liked our rhythm, I liked what we were doing, let's just stick with it. I thought we hung in there defensively and did about as good a job as you can do on Robinson and Bowman. They're just playing terrific basketball. Jimmy has done an unbelievable job with their team. They're in a really good position with how they're doing things. You could just tell the confidence that they were playing with today, that they were going to come back on us and make a fight. "I thought our guys did a lot of good things down the stretch handling some press, they mixed up some zones against us, 1-3-1 and 3-2. We did a good job of executing against a lot of different defenses, and we made our free throws down the stretch." For Clemson, their 90 points were the highest they have ever scored in an ACC Tournament game. This is quite a contrast to the 36 they scored against Virginia in a 61-36 road loss on January 23rd. Brownell said to the question of what is different about Virginia's defense, "What's the average? I'd like to -- we'll take the average tomorrow. What's different about their defense? I mean, they just do everything really well. They're unbelievably sound. (Virginia Head Coach) Tony (Bennett) obviously is as good a coach as there is in our game. "I think sometimes Virginia, because they play slow on offense, they don't get enough credit for how good their players are. I think sometimes everybody gets so into their scheme, but you don't win 17 out of 18 ACC games unless you have really good players. And they're big, they're athletic, and they're obviously very sound fundamentally. So they just do a lot of really good things. They're difficult to play against. "You know, the first time we did play them was the first game we played without Donte Grantham, so hopefully we're playing a little better than a two- or one-day prep for Virginia at Virginia without one of our best players."